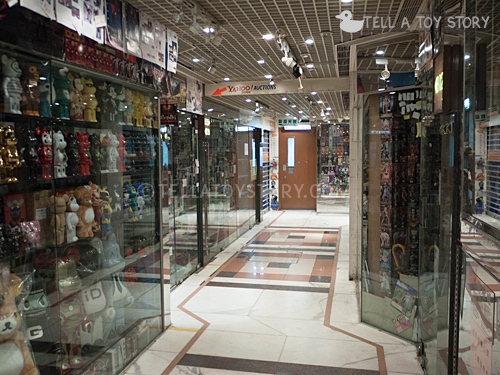 [Updated Apr 2014] Hong Kong is a shoppers’ paradise for toy lovers. Most of the toy shops are located in the Mong Kok district and that’s where I always stay when I visit Hong Kong. 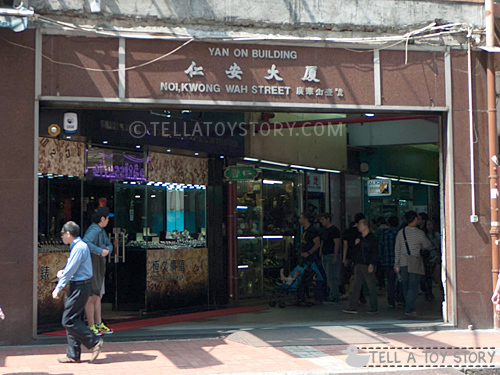 I have also included a short writeup on the toy street in Wan Chai district. Here’s a look at the malls I frequent for my Hot Toys, NECA, Figma, Nendoroid, Revoltech, gashapons and candy toys. This post has been updated in Apr 2014 and expanded to include the type of toys that can be found on each floor of the featured shopping malls. 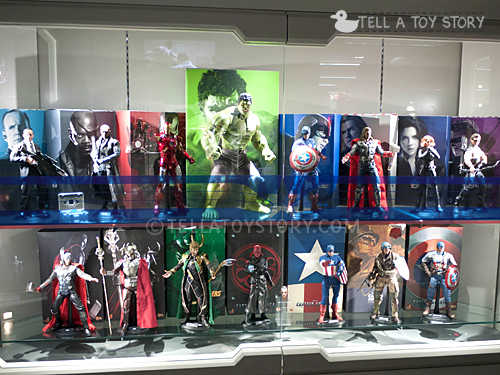 More recent photos including Hot Toys Secret Base, Enterbay and Tai Yuen Street have been added. I have also covered additional places to shop for toys in Hong Kong. Hope that this will make your toy shopping experience a fruitful and amazing one when looking for toy stores in Hong Kong. Happy shopping and browsing! This is one of my favourite mall. 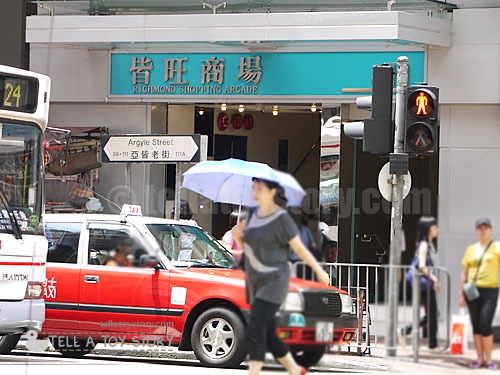 It is located just outside the busy heart of Mong Kok on Argyle Street. If you walk past this building without knowing beforehand that it has 4 floors of toy shops, you will probably not enter it due to the nondescript facade. A stairway leading to the basement, an upriding escalator and another stairway that links to the upper floors are all you see at the entrance. No fancy window displays or toy advertisements outside. Inside, Richmond has plenty to offer in terms of 1/6 figures, Transformers, NECA, Mcfarlane, Figma, Nendoroid and Revoltech. I got all my NECA toys from here. Don’t forget to visit the basement as the stairways is not directly linked to the upper floors. Thanks to this site for the recommendation. Basement: Shops at the basement are generally open from 3pm onwards, till around 9pm. You can find: Bearbrick, Kubrick, Bandai (Robot Spirits), Revoltech, SH Figurarts, Banpresto DXF Craneking, Figma, Nendoroid, Jojo, Soul of Chogokin Mazinger Z, trading cards. 1st floor: Most shops are already open by the time I visited on Sat at 1.30pm. You can find: 1/6 figures from Hong Kong movies, Real Steel, Police and military figures, Bandai PVC anime figures. 2nd floor: Robot spirits, S.H. Figurarts, Revoltech, Figma, Lego, some modeling kits, Hot Toys, Kamen Rider, 1/6 figures, busts. 3rd floor: 7″ NECA, 1/4 NECA, McFarlane, Simpsons, Revoltech Takeya, Military books, Conan, AVP, Pacific Rim, Halo, vintage camera. Another personal favourite, lots of Nendoroid, Figma, 1/6 figures & accessories and Lego can be found at In’s Point, near Yau Ma Tei MTR station. 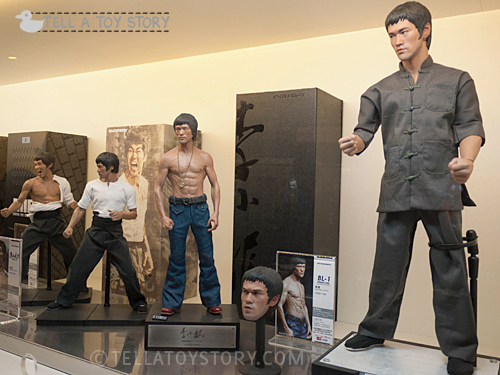 There is a shop dedicated to all things Bruce Lee too. In all there are 3 floors of toys shops but each floor is huge and has many more shops than Richmond Shopping Arcade, the top floor after that is a restaurant. I got my Hot Toys True Type bodies and Figmas from here. Nearest MTR: Yau Ma Tei Station, Exit A2, turn around and walk towards the main road, Nathan Road. Without crossing the road, turn left and In’s Point is less than 50 metres away on your left. Thanks to this site for recommending the place. Generally less 1/6 figures and accessories than before. More anime-based and Japanese branded toys now. 1st floor: Lego (sets and mini figures), Revoltech, Figma, Nendoroid, military supplies, model guns, lifesize masks from Predator, Ironman, V for Vendetta), Hot Wheels, anime cards & booster packs, card sleeves, boards, Tamashi nations Ultraman, Saint Cloth, Kamen Rider, Masked Rider, Bandai S.I.C., NECA, Banpresto PVC, Danboard, Playarts, 1/6 accessories, Gundam. Sino Centre is a very dynamic mall as the type of shops changes every time I visit within 1 or 2 years. In the mid-2000s, there used to be lots of shops selling mostly DVDs and Animes. Most recently in 2010 and 2011, console games, asian movie / TV idol photographs, photobooks and manga have taken over. There are still Japanese toys such as gashapons and candy toys (good for collecting whole sets) and trading cards. I also noticed more rental-type cabinets with random toys and gadgets for sale. The basement is mostly unchanged, and you will be able to find music CDs, DVD or Bluray boxsets from different regions. Great if you want to collect different boxset editions of your favourite movies for the different extras. Prices are competitive and all are original and legitimate sets. Nearest MTR: Mongkok station, Exit E2. Turn around and walk towards the main road, Nathan Road. Without crossing the road, turn left and walk for approximately 280 metres, you will see Sino Centre on your left. The entrance is a little obscure so look out for the large blue vertical signage that faces the pedestrian sidewalk. Located at Sino Centre floor 20, this new showroom, gallery and collection centre is every toy collectors’ dream come true. 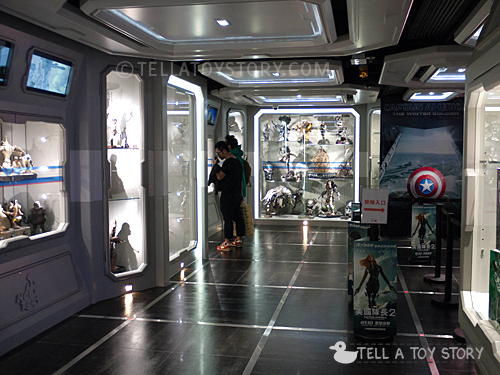 Virtually every single Hot Toys figure that has been produced is on display here. 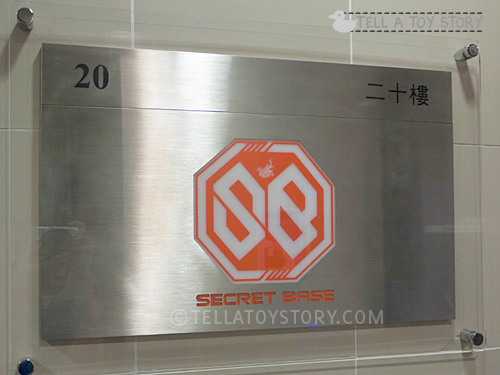 The Secret Base sign plate greets you as you exit the elevator at the 20th floor. Huge displays adorn the entire showroom. Photography is welcome as long as you do not take photos of staff members. The pre-order and collection area. The entire series of Hot Toys Avengers. Just one of the many displays you can see there. 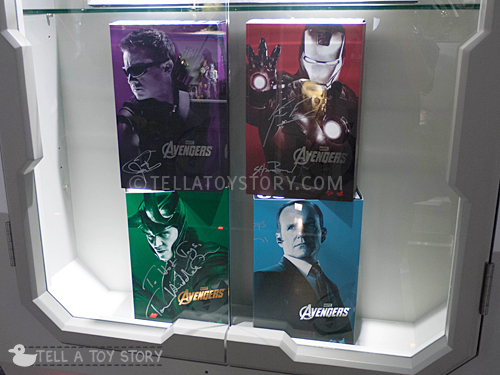 The autographed boxes of the Avengers series by the respective stars, proudly on display. 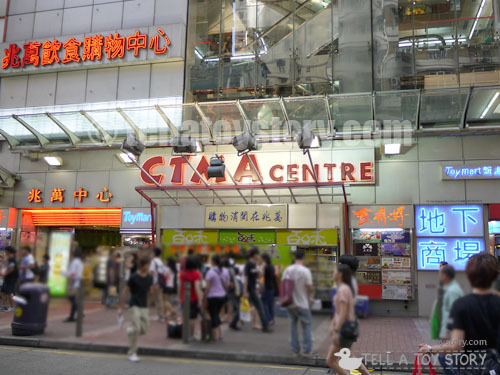 No visit to Mong Kok is complete without dropping by CTMA Centre as the other Hot Toys showroom is here too. Before the opening of Secret Base, this is where you go if you want to admire Hot Toys pre-orders on display. Going by the name “Toy Hunters”, this should be familiar to you when you look at your Hot Toys packaging box. All the upcoming prototypes are displayed here. There are a few floors of toy shops here but I don’t usually buy anything from here as I don’t find their prices competitive enough. You can find mostly Japanese toys such as Nendoroid, Figma, gashapons and candy toys here. CTMA is directly behind Sino Centre but you have to walk around the whole stretch of the building to see it. Nearest MTR: Mongkok station, Exit E2. Go straight ahead once out of the exit and turn right on Sai Yeung Choi Street South. Walk down the street for approximately 300 metres and you should see CTMA Centre on your right. If you are into realistic model air guns, RC helicopters, tanks, boats and cars, Kwong Wa street should excite you. Lining this street on both sides are such model shops. If you are hungry, consider having 1-michelin star Dim Sum from Tim Ho Wan. Be prepared for a long wait though. Nearest MTR: Mong Kok Station, Exit A2, 700 metres away. Walking directions is a little complicated so refer to map below. I choose a slightly longer route but there are plenty of clothing, electronics and eatery shops to see along the way as you will be cutting through the heart of Mong Kok. Here along Kwong Wa street, you will find the the Yan-On building which houses the Enterbay showroom and collection centre. There are also several shops selling army surplus (U.S. military supplies), hobby modeling, radio controlled (r.c. ), model guns & scopes. The entrance of the Yan-On building. Step inside to find the Enterbay store. 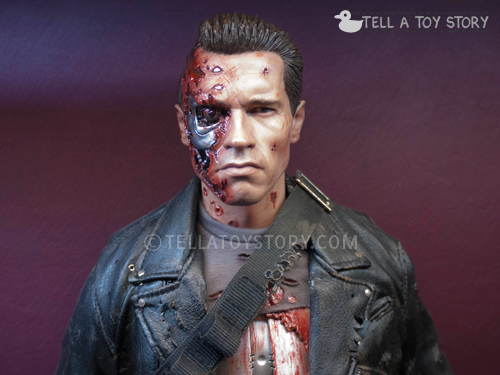 The battle-damaged Terminator T-800, the most realistic Arnold Schwarzenegger’s face sculpt on a 1/4 scale, in my opinion. A very cool shopping mall in Mongkok that was featured in the Korean popular variety show, Runningman. The distinctive digital sky, huge glass atrium and large display screens are on the “open” area at Level 4. Floor 11: 80m bus model shop. You can find bus models, planes, ships and models of Hong Kong landmarks and buildings. There is also a UML Hobby shop here where you can find Dragon Action (Ironman), Lundby(smaland), space collections, model cars, mimo dolls, model shophouses in the 80’s settings, re-ment, Gundam and Lego. Floor 9 to 12: There are several designer toy shops here featuring Hong Kong toys. Nearest MTR: Mong Kok Station. The station is linked directly to the mall via an underground walkway. This is a chain of lifestyle stores under the city’super group that carries various brands of toys including the exclusive metallic Starwars 3D puzzles. You can also find Line products, nanoblocks, nanodots, crystal puzzles, Starwars black series, Lego, Papero, Herocross, Torafu Architects building puzzles. Branches I have visited include the one at Lane Crawford (Times Square, Causeway Bay MTR) and Langham Place (Mongkok MTR). If you are looking for new Lego, Digimon, Nerf, Hasbro, Mattel, Disney toys, you can try Toys R Us. 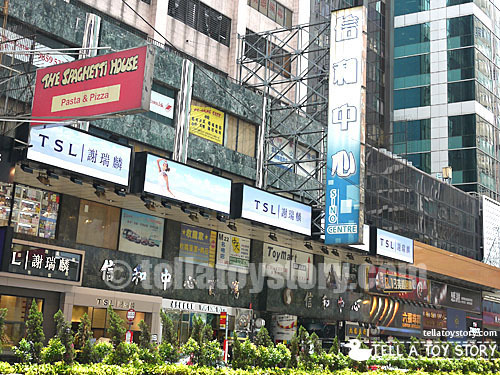 There are several stores in Hong Kong, the larger ones are located at Causeway Bay (Windsor House), Central (Nexxus Building) and Tsim Sha Tsui (Ocean Terminal). 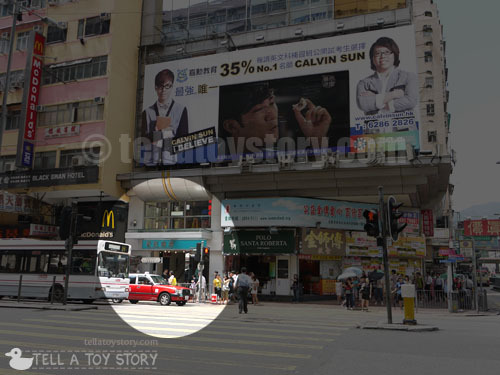 Tai Yuen street in Wan Chai district is also known as Toy Street and there are around 4 to 5 toy shops in this area. I find some of the shops resembling our local neighbourhood toy shops selling kiddo toys (for example kitchen playsets, unrealistic toy guns), but you may still be able to find a gem or two. Prices are generally higher than in Mong Kok. You can find Japanese toys such as gashapons, candy toys and an assortment of Sanrio toys. Toys that appeal to the younger generation such as Ben 10 and Beyblade can also be found here. Hung Hing toy shop. There are 2 outlets next to each other. Nearest MTR: Wanchai MTR Station, Exit A3, 80 metres away. Once you exit the station, cross the main road, Johnston Road to the other side. Turn right and walk about 30 metres. The start of Tai Yuen Street will be on your left. I noted down a few shops that seemed to stock the most toys. They are practically next to each other or opposite each other along Tai Yuen Street. Much further down Wan Chai, towards the direction of Causeway Bay, is Oriental 188. There are 3 floors of console games, PC games, mobile accessories (covers, screen protectors, battery packs, cables), Blu-ray, DVD boxsets. If you are looking for games on clearance or older games, you may wish to drop by, else I think it’s out of the way. I didn’t really see any toys for sale here. Thanks to this site which I found during my research for additional places to shop for toys. This place is really out of the way, but apparently they have been featured in many toy magazines and newspapers due to the nature of their business. They operate as a collection point for online auctions and sales such as eBay, Yahoo auctions and even Rakuten. They mostly stock toys based on consignment and so it’s a great place if you are looking for vintage or classic toys and out-of-print items.I spotted toys such as classic McDonald collectibles, old MacFarlane toys, Spawn, NECA, Lego, Transformers, Kenner and other toys from the 80s and 90s. Prices are generally quite high as these are hard-to-find items. Thanks to this site for providing the info when I was researching on toy warehouses. If you have time for some last minute shopping or regretted not buying that cute Mickey Mouse plush while at Disneyland, consider dropping by the official Disney store located at the airport. Hope this has helped you to plan your toy shopping trip. There are so many amazing toy shops in Hong Kong, do share your shopping experience and the gems that you have found with me and other readers in the comments section. Thank you! Hi, you can try the official Disney Store at the international airport or you can check out the malls mentioned in this post. Many shops in those malls sell Disney products. Toys R Us has Pixar Car’s toys. The little ones that are just a little bigger than Hot Wheels. For re-ments, you can try looking from the malls in the post, notably Sino Centre and CTMA. For Sylvanian Families, probably from departmental stores such as Sogo and Toys R Us. You can find Lego at Toys R Us and Mongkok shops. is there any figma , nendo at Toy r us ? is there any in causewaybay ? Figma and Nendo are mostly found in Mongkok shops. hi there! do u know where I can still find Hottoys Chris Taylor figurine in Hong Kong? and selling for how much? thanks! And for the toy shops in Mongkok and Tai Yuen Street, usually what time they be closed? For Hot Toys, you can try the shops in Mong Kok. These shops usually close at 8pm or 9pm. I’m sorry, but I do not know. You can try one of the malls, probably Richmond or CTMA, in the review; many kinds of toys and figurines in this category are sold there. HI, WHERE I CAN FIND 6″ SCALE ACTION FIGURE LIKE DIY, DRAGON, TOY SOLDIER ETC. You have to try the malls mentioned in the review, many action figures can be found there. Hi dyk where I’ll be able to find Alpaca (arpakasso) plush in HK and I was wondering about the “Toy Street” Fuk Wing Street, dyk if the toys are authentic? Thanks in advance! I’m sorry I do not know. Bootlegs are always a possibility so you have to check your potential purchases carefully before paying for them. Revoltech and Hot Toys can be found at the usual places: CTMA, In’s Point, Richmond Arcade. Yes, Ironman toys are very popular so it might be hard to get hold of them. hi ! could u tell me where i can buy ori toy? ( the website is : http://www.oritoy.com) I plan to buy them on my next visit to hong kong. Just an update if anyone’s interested, my post now includes information on Acid Rain toys from Ori Toy. The Acid Rain series is available in Sino Centre and CTMA Centre. Not sure about slugterra but you can probably find Pokemon at Toys R Us or one of the malls in the review. thank you for this information. I will definitely be stopping by! Are the prices comparable or cheaper? Prices are comparable actually. They used to be much better but prices are going up every year. The shopping experience is unbeatable though as the entire mall is stocked full of toy shops. Danboards are still being re-released so you might be able to get hold of new ones soon. Dear all, where’s the most affordable place to find Transformers collectibles? For good prices, you have to shop around and compare the prices. Most of the shops mentioned are in the same Mongkok area so at least it’s not that hard to run around. Is that sell any nendo SHFigure and other? Nendo and SH Figurarts can be found at the usual: CTMA, In’s Point and Richmond Arcade. Hello would you know if mongkok area sells star trek model ships? I’m sorry, I can’t remember. You can try your luck at the malls in the review as some of them sell model kits. Hey! Can anyone tell me where to buy WWE figures in Hong Kong? I have seen WWE figures at Richmond Arcade. Hi, where can I find gundam? Thank you! You can try In’s Point and probably CTMA. For BB guns, please try the shops along Kwong Wa Street as stated in the post. 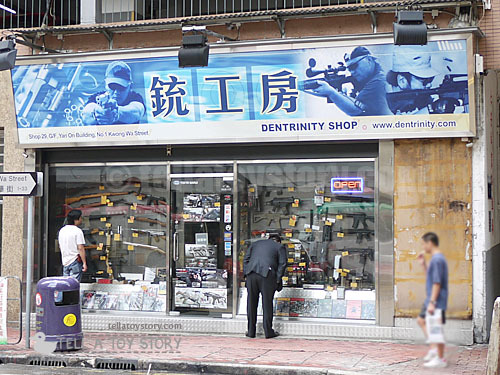 There are several shops there selling realistic looking toy guns and RC vehicles. What about Dragonball toys and loose 1:6 gear? Not sure about Dragonball toys. For loose 1:6 gear, you can try In’s Point or Richmond Arcade as stated in the review. You can probably try the usual, CTMA, Richmond Arcade or In’s Point. I am sorry, I do not know. You can try your luck at the shops in Sino Centre, they have rental display cabinets where collectors put up their old toys for sale. Hi, I would like to look for Lego and Tomica cars, but I can’t finish all the malls as I have limited time. Where would you recommend to find both things ? Probably Toys R Us. Addresses are in the post so you can look for one near your place of stay. Hello! I’m looking for a “pacific rim” toys, is a NECA brand. Would you recommend any shop in HK? Thank you in advance :). NECA’s Pacific Rim rocks! You can try Richmond Shopping Arcade, many shops selling NECA there. i am looking to buy Kaizoku Sentai Gokaiger toys in hk at a store that ships to canada. where would you suggest i contact? I’m sorry, I do not know for sure which store ships internationally. I can’t remember about Disneyland Hong Kong but I know Toys R Us in Hong Kong sells Lego. For vintage Transformers, you can try Richmond, CTMA or In’s Point. There are also rental display cabinets in Sino Centre for people selling their own collections. i am looking for hello kitty, where i can find it? Just an update, I have seen Hello Kitty toys in CTMA and Wan Chai toy street. Thank ou for your wonderful write up and all your many replies. I have found this to be very useful. Can you please advise me where I can find Takara Licca dolls at low prices? Thanks for your kind words. I am not familiar with Takara Licca so I Googled this line of dolls to see what they look like. I think you might be able to find them in CTMA centre as there are some shops selling dolls over there but it’s just a guess. Nice and useful article on Hong Kong’s toy scene! Thank you. Just wondering, I’ll be visiting Hong Kong for a month this December/January… and I wanted to know if you’d be aware as to how toy shopping in HK compares to Tokyo and Osaka? I’ve been to every toy store known to westerners in both cities, including Kobe and some other parts of Japan too. At the moment I’m tossing up if I should still go there, but I’m not happy about the radiation contamination that has engulfed Japan’s main cities. Having said that, I’d only be going for a month, so I’m not to worried, even though their food is also contaminated : ( I mainly collect Macross, vinyl Kaiju toys, a bit of 1:6 scale (mainly Hot Toys) and all types of Japanese vintage toys. Do you feel that Hong Kong would satisfy my tastes? Because I really do want to visit Hong Kong also. Thank you in advance, if you’re able to answer. I stay at Cityview hotel, best place for staying since the location is very close to Ins Point and Sino centre, walkable to nearest MTR Yau Ma Tei just 1 station to Mongkok to reach Richmond. You can see CTMA from your hotel window view. Can I Buy any WWE Figures in toys r us hongkong or any place in tsim sha tsui? Sorry, not entirely sure about WWE in Toys R Us but I think Richmond Arcade has shops selling them. hi there! thanks for sharing all these wonderful info. Will be visiting hongkong in a week time. Was thinking which are the malls which I must focus on if I am looking for kamen rider medicom toys and iron man hot toys? Also, do you by chance know of any shops that do custom painting of 1/6 figures? As I might be bringing my toy over for repainting. Medicom in general (not sure specifically kamen rider) can be found in CTMA centre. Hot Toys in CTMA and In’s Point. As In’s Point has 1/6 kits and a few model shops, you might be able to find a shop to do repainting for you, but this is just my guess. all right man. thanks for the info! I’m sorry, not familiar with funko pop toys :( You can still try the Mongkok malls mentioned in the post as they sell a wide assortment of toys. I love your well dcoumented site for 1/6 collecting. As I am staying at Kowloon Hotel later this month, I only have one day for shopping. Can you kindly recommend me which place is best in terms of pricing for buying 1/6 accessories, Richmond Arcade or In’s Point? Thanks! It’s really hard to say as prices vary between shops. From my memory, I would think In’s Point has more shops selling 1/6 accessories. If you only have 1 day to shop and are going to Mong Kok area, you can afford to check out most of the toy malls there as they are all between 2 stations (Yau Ma Tei and Mong Kok). Just note that they don’t open that early, some open near noon or after noon. Do you know where in HK one can find vintage Corgi, Matchbox, & Dinky toys for sale? I’m sorry, I do not know. I hope other commenters here can answer your question. Btw, all comments are moderated, meaning they have to be approved before they show up. I don’t delete comments unless they are spam. Hi! Do you know a place in kowloon, preferably in mongkok, that sells official pokemon trading cards? I heard that there were a lot of fake cards in hong kong though. Thanks a lot! I’m not sure about Mong Kok, but you can try Tai Yuen street in Wanchai. There are a few shops there that sells trading cards. Thanks alot, man! Happy Holidays. Hello! Thank you for showing us how to find nendoroid and all other kinds of places to buy toys. From the many stories about fake stuff in HongKong / China are the nendoroids you buy in Richmond Shopping arcade originals or fake ones? thanks for the information on this website. I’m looking for japanese plush toys in HK. I have visited a couple of your advised shops but they generally sell model figures. I’m looking for numineko, totoro, tofu etc. plush dolls. Could you please give me some advice. For Japanese plush toys, you can try Animate that situated across from CTMA centre. Which floor is the wwe figure in richmond arcade ? I can’t remember but Richmond Arcade only has a basement and a few floors above ground. It’s not difficult to browse through all the shops quickly. I am looking for dayan guhong/ rubik’s cube shop in HK and not the online store. Anyone know, please help. I’m sorry, I am not familiar. Hope other readers can answer this. Hi and thanks for a great info site. I’m traveling to Hong Kong in a few weeks and want to pick up some small Mine Craft figures for the grandkids. Any idea where I might find them? I’m sorry I am not sure where to get them. I hope other readers can help you out. Kwong Wa Street has shophouses selling model guns but I haven’t really seen anime model shops there. Btw, do you mean iron man helmet or a helmet made of iron? I hope you can get your answers from other readers. Hello. I’m in HK in three weeks time, looking to buy Blythe dolls and Sonny Angel Kewpie – any ideas where to go? Any ideas. Thank you. Hi, you should be able to find Blythe dolls in CTMA centre. You can check the same place for Kewpie, but I am not sure if they have it. is anyone know where to find G I joe toys at Mongkok area, the new release series such as retailation series etc…..
GI Joe should be available in Richmond Arcade, you can also check the usual places: CTMA and Sino Centre. Not sure if Toys R Us still carries them. thanks a lot !!! appreciated it, i am thinking of going toyzone lo which is at Tai Gu and abit out of the way. Hi i,am looking for damtoys in hongkong where can i find it? Since DAM toys are 1/6, I should think the usual places such as Inn’s Place and Richmond Arcade should have them since they stock many one-sixth scale figures. Sorry, I am not familiar with teddy bears. I hope someone else can help you. Where can I buy a nice silk chinese kite for grown up boy in Hong kong ? I’m sorry, I do not know. 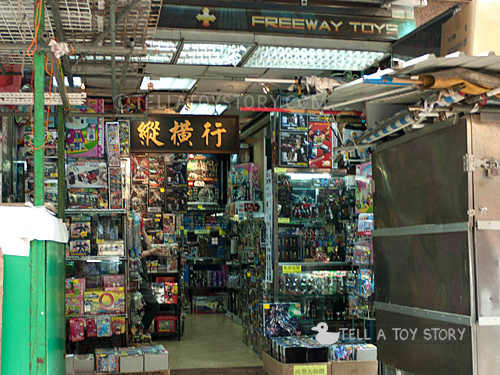 Wanchai toy street has some shops that sell neighbourhood type toys, you might want to try there. Medicom RAH are 1/6, which can be found at In’s point. The new EVA 00 seems pretty limited as it is a wonder fest exclusive so I am not sure if you can still find them. You can also try your luck at the basement of Richmond Arcade and some of the shops in CTMA centre. Hi, do you know where to buy real steel robots (for kid) and pacific rim action figure? Thx. Not sure about real steel. Pacific Rim figures are from NECA, which can be found in Richmond Arcade and CTMA centre, but they are rather popular so I am not sure if stocks are still available. I’m sorry I’m not familiar with old robots. You may wish to try your luck at Sino Centre as there are many rental cabinets featuring items from the after market. Any idea where to find bearbricks and kaws? I believe there are bearbricks in CTMA and Richmond Arcade. Not so sure about Kaws though. Great writeup! I’ll be heading to HK next week and this information here is truly invaluable. Thanks! Any idea where to get vintage toys like ghostbuster, tmnt, motu etc? You can try your luck at Richmond or In’s Point as I have seen a few shops there selling vintage toys. Where the most marvel legend 6 inch shop? 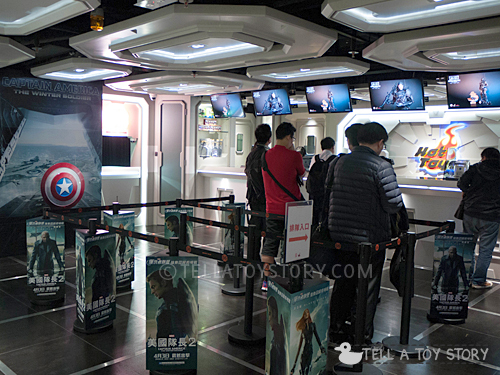 Marvel can be found in most of the Mongkok shops listed in the post. Hard to say which mall has the most. Are there S.H Figuarts Dragon Ball at In’s Point? Or maybe Play Arts Kai especially the Tekken line? Thanks! Can’t remember exactly. I have listed most of the items in my post so I hope other readers can help you. I was wondering where the best place to find funko pop vinyl figures specifically marvel ones is? Thanks in advance your post is really helpful! You should be able to find funko figures at CTMA and In’s Point. For specific ones, you will have to check the individual stores as stocks vary from time to time. I just want to ask, since I wouldn’t be able to visit all places, where is the best place to find cheap prices/best prices for Legos? Going to look for Batman and Harry Potter sets. Thank you very much! Thanks for your kind comments. :) For large Lego sets, you can check out the Wanchai shops, although I am not sure if their prices are good, but they sure have plenty of very large themed play sets. 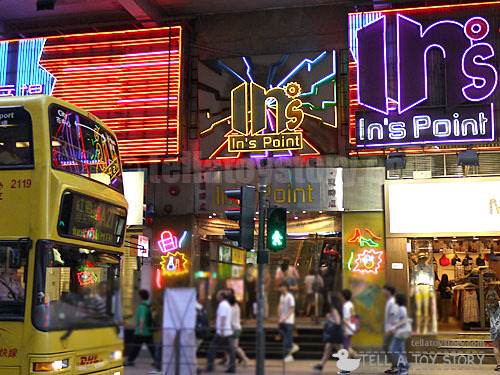 If you are in the Mongkok area, you can check In’s Point. I’ve not been, but there’s AA PLACE, the self-declared largest and most famous Lego shop in Hong Kong. It’s on Hong Kong Island in Sheung Wan, which is the district just to the west of Central. I live in Hong Kong and am familiar with most of this, but just wanted to say what a detailed and impressive resource you’ve cobbled together here. I will be in HK at the end of July and i will visit the toy stores in. Mongkok. Ive been there a couple of times looking for my toy collection. But this time, i will be looking for T for Candy miniatures, dollhouses, Blythe dolls, Re ment minis. Orcara minis, Mimo minis and the like, can you tell me where exactly can I find those toys in Mongkok and in other area in HK so I can go directly when I arrived.Thank you in advance. Hi, I wanna ask ctma centre opening hour is what time until what time? The shops there are generally open till 9pm. First of all I would like to say that your guide is amazing! Awesome work! It helped me a lot, this is how I found In’s Point so a huge thank you! I am looking forward to future guides! That being said, I was wondering if you could give me any advice on buying Figmas and Macfarlanes in Hong Kong. I am most interested in the Figma Amazing Spider Man 1 and 2 (I am aware that TASM2 will be released in Sep/Oct 2014) and in McFarlanes Halo figures. I tried looking in Causewaybay (Metro comics, Clarks comics) and at In’s point. Most of the figures I am “hunting down” are out of stock or I just couldnt find them. I might have missed some stores at Ins point as I went there three times total last week (got hot toys War machine and Marvl legends ASM2 *yay*). Perhaps I. just dont know where to look? Any idea where I should go to get them? Hey you are welcome and I’m glad that my guide has helped you ^^ For Figma, you could probably try the basement of Richmond Arcade (they open at around 3pm) as those shops tend to stock toys of Figma size, such as Revoltech and S.H.Figurarts. Many of the shops there take pre-orders if you are looking for upcoming releases. There is a shop at the 3rd floor of Richmond Arcade that sells McFarlanes and NECA, but I can’t remember if they have Halo figures. This is a common issue with popular toys: shops tend to have limited storage space so once they are sold-out, they are seldom restocked. Sometimes they have limited allocation. Hi.. just want to check if where can I find old releases for TOMICA TAKARA ( e.g. batmobile )..
Takara Tomy Tomica cars can be found in Tai Yuen Street (Wanchai). For specific models, you have to try your luck as stock varies. Can you help me find a good source-shop please? Have not really seen those. Guess you will have to look for hobby kit shops or try your luck at Sino Centre since there are rental cabinets for people selling older stuff there. Thankyou, sir…this website are very helping me to find many addres of toy&figure shop in HongKong.. Now my sister are going to shopping in Mongkok this night.. I order her to buying me a BANDAI Patlabor Griffon Flying Unit J-9 1/35 scale Master Grade…can u tell me, where’s the recommended toy shop that my sister can visit to find it ?? Thankyou very MUCH once again !! 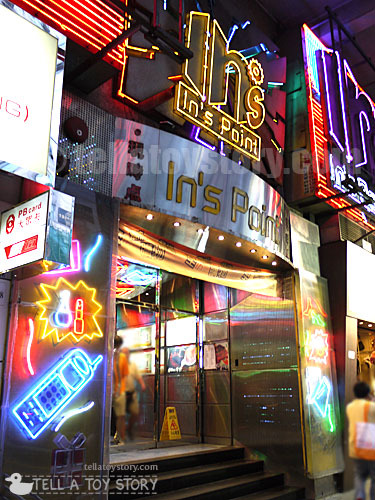 For Gundam, you can try In’s Point in Mongkok. There are many Gundam model kits in Tai Yuen St (Toy Street in Wan Chai) too if you are in the area. New toy prices and pre-orders are very reasonable. Same as elsewhere, if you are looking for older items, they may be priced higher due to demand or even be completely sold out. Can you please advise me where I can find nano blocks? You can find nano blocks in the Log-on chain stores and also Tai Yuen Street. Look for the address in the post. :) You will probably also find them in CTMA basement shops, but I am not 100% sure. I’m in Hong Kong at the moment looking for diecast bus models. I’m familiar with 80M and I’ll also drop by Tai Yeun street as they had some stuff last time. Any other suggestions welcome. Can anyone tell me where to buy Morrigan Aensland and Catherine figures in Hong Kong ? Hi, do you know where to get Wholesale party supplies etc partty hats, cups, plates, favors. Theme: disney, hello kitty, princess etc in Hong kong? Or China would be better? There should be some distributors at Wan Chai Toy Street. You can price check among the shops there. I am not familiar with China as I have not been there to purchase wholesale supplies. Just a quick one and wondering if any of you guys above managed to see any Neca Rocky figures or Jakks pacific? Jakks pacific Rocky figures. I fly over for 3 days of toy shopping (personal collection and there are a few bits that I am missing. Hi, thanks for all the info and recommendations. Do any of the shops in In’s Point open around noon as I cannot stay later than 2pm. That’s really hard to say as I always visit in the afternoon, after 1pm. I would say at noon, most shops might not be open yet. Guess you just have to try your luck and try to hang around for as long as you can. I noticed that online HK and China sellers Have loose GI Joes and Star Wars figures. I am wondering where in HK can I pick them up. Or do I have to go to Guangzhou or somewhere else? Hi, where I can get a dunbo toys, thank you! 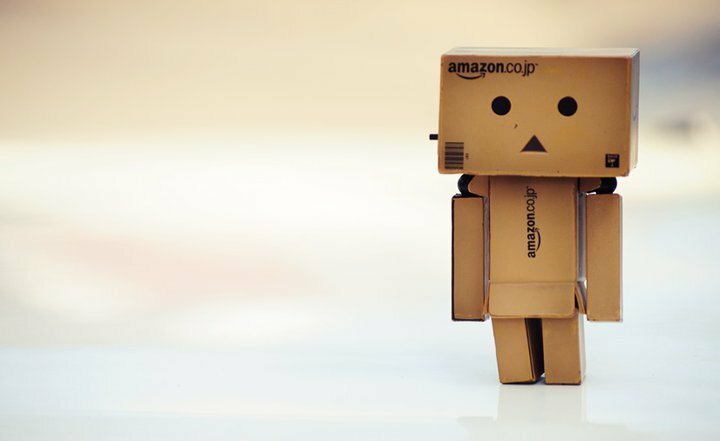 If you are referring to Danbo (Danboard), you can find them at In’s Point and CTMA. I bought both my mini danbo amazon version and the normal version there. Where in HK can you buy Funko Pop items ? If I am not mistaken, I believe I have seen Funko Pop toys at CTMA centre. Hello good afternoon. Where I can buy these couple stuff toy where they put in front of the bridal car? Thank you. I am in asia for work in Thailand in particular. unfortunately the change with euro is not good. are fond of Saint Seiya. do you think if I went three days in hong kong I might find something interesting with prices more ‘low? and where should I stay? because time is very short. Yes, you will find that prices of toys in Hong Kong are competitive if you shop around. I have seen Saint Seiya in Mongkok shops. Prices of hotels in Hong Kong are generally more expensive than other Asian countries, such as Thailand. I stayed at City View in Mongkok (next to Yau Ma Tei MTR station) on the recommendation of another reader. 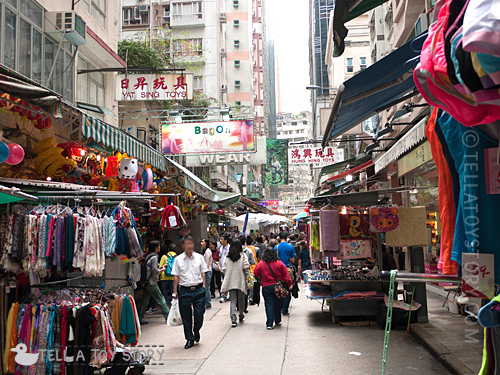 I found it very convenient and affordable if you just want to shop around in Mongkok during your stay in Hong Kong. Good luck! Thanks for all the hard work you put into this, I hope it hasn’t been mentioned already but would you know where I could find the Japanese sonny angel dolls? Thanks! Hello, Great site! There was a vintage toy shop selling many 80s toys featured on TVB on Jan 11, 2015. Do you know where in Hong Kong this toy shop is?? Many thanks. I am not residing in HK so I was unable to watch the show. From the synopsis, neither the name of the toy shop nor location is mentioned. Hi, do u know where to buy good remote toy car…? Range more abt 30m, so so powerful..
You can find RC cars at Kwong Wa street. Do check out my post for the details. 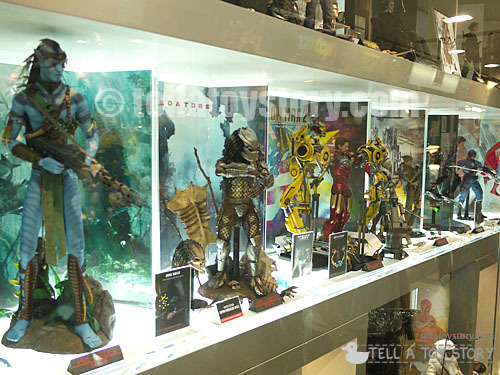 Question, you mentioned Halo toys, Im guessing those are the Mcfarlane range? 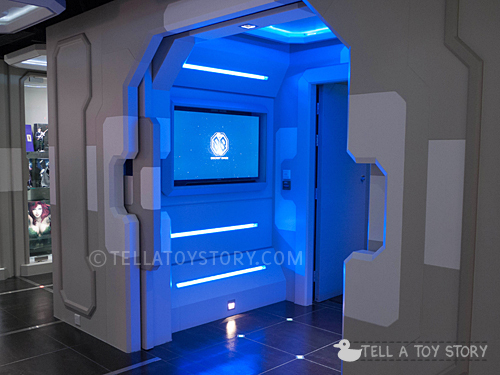 I was wondering if you have seen any Halo Mega Bloks toys in your travels in Hong Kong? Or where I am most likely to find some? You are correct, I was referring to the Halo range from McFarlane. I can’t remember if Mega Bloks can be found in Mongkok or Wanchai but your best bet would still be these places. I will look out for them the next time I visit Hong Kong again. I did not note down the prices of McFarlane but I think they should be reasonable since NECA prices are fine over there. Can you please tell me where can I find Siku Toys diecast. I have seen Siku diecast toys in Wanchai toy street. There are also diecast model hobby shops in Langham Place, Mongkok but I am unsure if they stock Siku. Do read my post for more details. Hi Iam going to hong kong where can I found Takara tomy transformers? Transformers are very popular in Hong Kong. You can find both Hasbro and Takara Tomy Transformers in all the places I covered in my post. Hello I am heading to Hong Kong soon and I would like to know where I can find Kamen Rider and Super Sentai toys? Thanks in advance for this article, it was a good read. You can find these at In’s Point. I was curious how popular Transformer toys are in HongKong, especially the Transformers made by Hasbro or Kenner brands. I noticed many hongkong toy business people get their toys from Ebay but I was wondering how many PERCENT increase do they resale a transformer toy in HongKong after they already paid BIG Price on ebay… How do they make money? Thanks I am just curious because I noticed one buyer in HongKong bid on over 500 transformer toys.. LOL HAHA insane.. Thank you for this wonderful blog! I was looking for a good guide for toy shopping in HK. We’ll be going there on August and I hear it’s a Sales month. Are toys covered too? I’d like to hunt for cheap hard to find transformers toys. Can you suggest any that is in walking distance with Chungking Mansions, Tsim Sha Tsui? Hong Kong summer sale period is from July to September. These sales are usually for clothing and cosmetics departmental stores at shopping malls. I can’t really find any collectible toy shops in Tsim Sha Tsui as that area is more for up-market shopping malls and boutiques. You can visit Toys R Us at Harbour City / Ocean Terminal if you like. I prefer to shop at the Mongkok area for toys. Thanks for the reply. We’ll definitely go to Mongkok. Can you recommend a particular store there which has the lowest priced Transformers figures even the used or loosed ones? How much do they go for? That’s really hard to say because stock and prices vary according to demand. I guess the best way would be to shop around and compare prices since there are many shops that sell Transformers. Good luck! Do you know where to go for a selection of tachyon / capsule toy machines? Also are there any gaucho on with local monuments, etc in them? Thanks. I meant gachapon machines in Hong Kong. Sorry for autocorrect. I have not been there, maybe you can take a look when you get a chance? They have several outlets. HI is me again and can you find in Hong Kong transformers United figurs? CTMA in Mongkok should have it. Some commenters have also mentioned that Funko Pop are popular in Hong Kong and can be found at most toy shops. Do you know where I can find the cheapest prices for metal nano puzzles. Is it just found in Log-on chain stores? where can i buy original peppa pig family action figures in hong kong at reasonable prices? and super hero hulk, iron man, spider man,super man, captain of america, thore costumes? do you know where i can find disney’s magic clip princess especially for princess teana. Could not find it anywhere in tokyo or singapore. I will be in hongkong later this week, perhaps you can tell me where to go. Already looked into toyRus but they dont have that character. 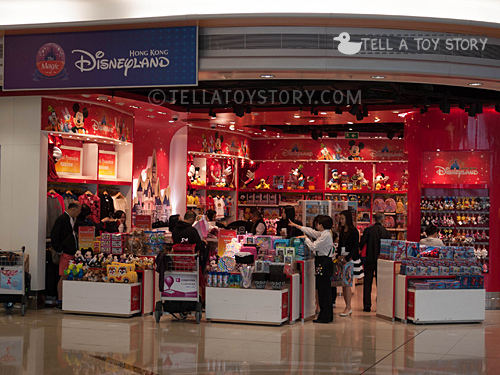 I’m not sure but you could try the Disney store at the airport. Where’s the best place for 3A toys (Ashley Wood) or Weta Collectibles ? For Weta you have to scout around. Hi, thanks for the post! I just got my Touhou Kirisame Marisa nendoroid on Richmond. Hi, any idea where i can buy takara tomy pokemon figures? What a very nice and helpfull information you give..
Do you know where to find lego, and tomica for a good price,, sure if can lower than singapore. Tomica and Lego can be found in Wanchai Toy Street. one more things, does in hongkong disney shop sell, tomica disney resort model? I’m sorry, I do not know. But there is a Disney shop at the airport so you can try asking them. I just want to ask where I can buy 1/6 backboard set by storm toys in one of the store’s in Hong Kong? 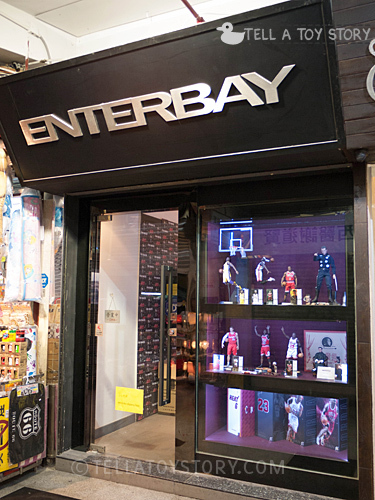 Also, do you know the store hours of enterbay store in Hong Kong? Starting from 20th August 2013, our Hong Kong Flagship Store opening hours will be from 1:00pm to 9:30pm, from Monday to Sunday. As for Storm Toys, I’m not sure but you can try the usual malls which sell 1/6 figures: In’s Point, CTMA, etc. Do you have email address of this particular toy shops (In’s Point, CTMA etc) in order to communicate with them and I will ask for the stock of figure that I’m looking for. By the way, thank you for the information. where can I find 1/6 remote vehicle like mini cooper or bettle also 1/6 motorcycle ?? RC cars can be found at Kwong Wa Street in Mongkok/Yau Ma Tei area. As for Fuchiko, I am not so sure. Since they exist mostly in Gashapon versions, you may be able to find them at CTMA. Hi, anyone know where to get vintage zoids in hong kong ? Will travelling there soon. Thanks. If you wanna try your luck for vintage Zoids, you can check out In’s Point or Toy Zone but it really depends on availability of stocks at that moment. Do you where I can buy good quality Chinese toys? You can find traditional Chinese toys along the shophouses at Tai Yuen Street (Toys) in Wan Chai. Read my post for more information. Hello! I’m looking figure batman arkham knight brand NECA 1/4. I will soon travel to Hong Kong, you may find this figure in your shop? what is the price in dollars? thank you. A greeting. Sorry, I don’t own a shop there. For NECA, please check out the usual places such as Richmond and CTMA. Where is the best place in Hong Kong to buy Halo action figures. Thank you in advance for your assistance. For Halo figures, please check the usual places in Mongkok: CTMA, Richmond, In’s Point. I won’t be able to tell you which places have the best prices because some shops may have discounted sales. You have to compare prices between shops when you are there. Hi! I’m looking for Lilo and Stitch merchandise. Can you suggest places apart from disneyland where I can buy them? Probably from Toys R Us then. Check out CTMA too as they have stores that sells plushies. Where is best place to find beyblades? Beyblades can be found at Wanchai Toy Street. Hi I’m a newbie collector of 3A toys in Manila. Hoping you won’t mind me crowd sourcing. I will be going to Hong Kong on January 1 and would like to ask if any of you know stores in Hong Kong where I can buy 3a toys? Your advice will be greatly appreciated. Thank you. Hello! Great list you got here! But do u know where I can buy anpanman kids stuffs in hongkong? Is there a shop similar like Sanrio thingy or a kids baby toy store? Hi, thanks before. I really appreciate this article good and informatif. Btw.. do yoy where the place at HK which sell real gundam whose from japan (not daban), the best price and complete sell gundam collection store? Thank you for your kindly feedback. Gundam is very popular and available at all the malls I mentioned. Prices vary all the time so you have to compare and price check when you are there. marvel legends can be in toyzone, inspoint , richmond, metrocomics in causway bay sugar street. Which are the working hours of the Secret Base and the toy stores at CTMA? I will be only 1 day in HK (monday). As for the other toy stores at CTMA, they are mostly open from noon or later till around 9pm too. Helo, what a nice info! Btw I’m at Hong Kong rite now, and do you know which store that sell a lot of dragon ball toys? Try your luck at the basement of Richmond Arcade. 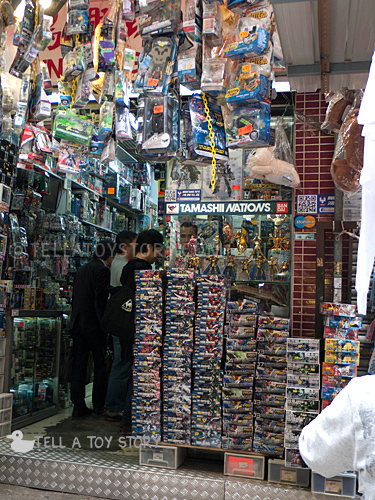 There are many shops there selling a large assortment of toys. Nice compilation of the toy shops. Would you happen to have any idea does any HK toy shops sell “Visionaries: Knights of the Magical Light” figuirines? Where can I get funko stuff in Hong Kong? Hi, your question has been answered before, try CTMA. Thank you so much, mpcollector, for all your replies. :) You have been very helpful. I’m a big Disney PVC/figure collector. Do you know where the best place in HK is to find old Disney toys (Not Disneystore) and Disney Medicom/Disney Tomy figures? If you want old Disney toys, you can try Sino and CTMA centre. Hi, could you please tell me if there are any Pac-man toys around somewhere in HK? Our son is crazy about Pac-man and I dont even know where to start looking. Thanks. Perhaps you can start there. Hi.. i wanna ask about diecast (military – tanks or police) which one i must visit.. the price is cheapest. Where can i find Funko Pop figures? Hi live in Hong Kong and recently was looking for funko pop figures but I couldn’t seem to find any around the Hong Kong district. Do you know any places I can get them in Hong Kong???? Hey there, do you know any places that has Funko Wacky Wobblers or the Funko Hikari line? Preferably the older range. Thanks! i’m looking for TOMY: POP UP PIRATE toy! do you know where i can find this? hi is there like a specialty store where they sell 3.75 Star Wars figures like from 2005-2010 released? thanks! Great article! Do you remember seeing any 1:1 Predator Mask around? Please email me at davidtan217@gmail.com if you have as I’m traveling over tomorrow itself! I have seen 1:1 predator masks at In’s Point a few years ago. Not sure if they are still available now. Good luck! Try the usual malls I mentioned in my post. Many shops there sell S.H. Figuarts. Hi bro, nice blog! Anyway I am heading to Hong Kong 2 weeks later and I would like to check with you that can I find portrait of pirates in those shop that you mentioned? Hi, i’m going HK next week, where can i find Bandai Movie Realization Star Wars 名将 figurines? You may also checkout out the typical malls such as CTMA, In’s Point and Richmond in Mongkok, and also the toy street in Wanchai, as the shops there usually stock plenty of Bandai products. I know someone going to HK soon and was wondering where would they find anything digimon related like Digimon mini or the digivice. You can find Funko Pops at CTMA and In’s Place. Hi i am looking for mack n zack travels , where can i find them in hong kong. Hi there, does anyone know where can I get Statue scale 1/4, 1/3 in Hong Kong? Also I am looking for Cinemaquette Batman. Is there any clue? please help me. I am in Hong Kong now. Have you tried Metro Comics at CTMA basement, Mong Kok? They also have an outlet at Causeway Bay Shopping Centre, Causeway Bay. They carry Sideshow Collectibles and other statues. Hi there. Do you know where can I find digimon devices in HK? It is like digivices, virtual pets etc. Have you tried Toys R Us? Could you tell me where I can buy some “Saint Seiya” toys in Hong Kong please ? 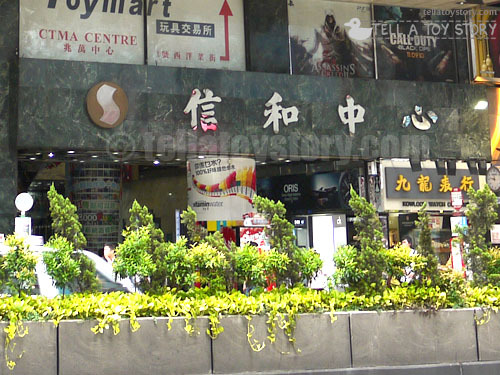 Try the usual malls located in Mong Kok, I have seen Saint Seiya in some of the shops there. I’m looking for NECA Ripley from ALIENS and or the power loader? Thanks! Ah, NECA Ripley and the Powerloader has been released for some time already, so they should be mostly sold out. You can try your luck at the usual places for NECA: Richmond Arcade, CTMA and In’s Point. My son is a fan from Forces of valor on scale 1.32. He have 16 years and handicapped due a drunk driver. Please can you help me for found adress where some shop have Forces of Valor for sale please. He have many, but some model is impossible for found on Europe, this is a China made. If you send me an email I send you what him search and I can paid with Paypal. For the delivery I have a supplier on Hong Kong. Thank you in advance, your sincerely JJ, greetings from Belgium. Hi, thanks for all the information you shared. I’m visiting Hong Kong this September. I wish to buy Hotwheels car models. Can you suggest me where? Hi, do you have any toy shop guides for Shenzhen? I’ve noticed a lot of export sellers on US eBay are located there I would love to browse any possible physical shop standS. Thanks for the informative blog! I have only been to Shenzhen (it is part of Mainland China) once many years ago, took a train from Hong Kong. Saw a lot of counterfeit designer goods at the mall nearest the train station so I would be wary of the authenticity of the toys sold there. Not sure if it’s still the case now. Hi, i just wanna ask were i can buy classic cheaper toys like GX-43 Daimos? Try the malls in Mongkok. I’m interested to buy this Premium Bandai model kit while I’m in Hong Kong early next month: Chogokin GE-48 Frontier Macross Quarter S.M.S Transformable Space Attack Carrier. Here is the link on eBay: http://www.ebay.com/itm/Macross-Frontier-Chogokin-GE-48-Quarter-S-M-S-Transformable-Space-Attack-Carrier-/370626592568. As I’m visiting Hong Kong on 8 November 2016 – 11 November 2016, I’d need for your help to kindly inform me where I can find any shop specialising in Bandai Premium products like this, which is close to Mira Mall (close to Tsim Sha Tsui Station). Your help is really appreciated. Thank you very much and have a pleasant day! Tsim Sha Tsui area is mainly a shopping district with modern malls and commercial toys, not so much for hobby/model toys. If you are looking for Macross model kits, try WanChai Toy Street where there are at least a few shops stocking Gunpla model kits. I also read that Fuk Wing Street near Sham Shui Po MTR has wholesalers for toys, but I have not been there before. I am visiting to Hk on this 18 Nov 16 till 22Nov 16 and staying in Mong Kok. I am looking forward to visiting the shops that selling variety of 1/18 diecasts car (Autoart/Kyosho etc). Highly appreciated for your help. Thanks in advance. Yes.. Thanks for the reply, looking forward to visit it..
Do you know where i can find Tomica diecast? You can find Tomica diecast cars at Tai Yuen Street (Toys). Hi, you can find Playarts Kai at In’s Point and CTMA. Both malls are in Mongkok. I am traveling to Hong Kong next week & for the first time I am staying in Central! I normally stay in Kowloon, where I shop at Sino, CTMA, Ins & Richmond. I have no idea where to find anime, movie, video game & pop culture related product in Central so any suggestions would be much appreciated! Hi. I’ll be in HK first week of April & staying at Cityview. My son loves trains esp Thomas & friends. Where can I buy these? Any vintage trains too? Hi, You can find Thomas & Friends in Tai Yuen Street. It’s mentioned in my post. Hi, I just want to say a big big thank you for compiling this list! My partner will be extremely delighted when I show him this list of toy shops in Hong Kong as we will head there in June, haha. Thank you so much, you’re the best! Hi! Is it cheaper to buy Hot toys at Secret base? If not..where should I buy at Hongkong? Secret Base caters mostly to preorders. For prices of existing stocks, it’s best to shop around the areas I mentioned and compare. Hi. Thanks to you my son had a blast with these toy havens. We were able to find both Thomas & Friends trains and many kinds of trains mostly in In’s point & Sino centre. We’ll definitely come back for more. By the way, is there a toy mall such as these in Japan as well? We’re planning to go around October in Osaka. Hi! Thanks for such an awesome post! I’m looking for Mr. Vampire 1/6 scale figure by YY Toys! May i know where can i find these? Your help is really appreciated. Thank you very much ! For specific toys, you have to check out the malls when you are there as stocks vary from time to time depending on popularity. 1/6 scale toys can be found in the malls I covered: In’s Point, Richmond, CTMA. I’m looking for Sofubi toys, MAGURO senpai, Red Hot Style, Black Seed Toys. Can you help me where can I buy those? Hello, Where can I find Harry Potter Merchandise in Hong kong? Probably try In’s Place, CTMA or Richmond, the usual places in Mongkok. Hi, I’m a Transformers G1 collector. May know where can I still find these toys in Hong Kong. Where can I find Dragon WW2 action figures and Barbie dolls? Thanks! For 1/6 figures, please try Richmond Arcade and In’s Place. For Barbie dolls, can probably try CTMA and Toys R Us. hye..im going to hong kong on 14 dec..where is the best place to buy diecast such as hotwheels,grennlights,tomica,autoworld and many more?tq..
Where in HK toy stores can I buy a Nerf toy? They mostly have japanese toys but also a selection of more western stuff. They have airsoft guns and may have Nerf (don’t know for sure). do you know some places in hong kong where i can find mafex figures and sh figuarts star wars figures?